c) the water level inside the inverted jar goes up because oxygen has been used up. Yes, that’s what we initially though too! But it’s all pretty much incorrect! Water is sucked up inside the jar … but why? Yes the candle uses some of the oxygen up burning the wax, but in return produces carbon dioxide (also a gas), and water vapour. 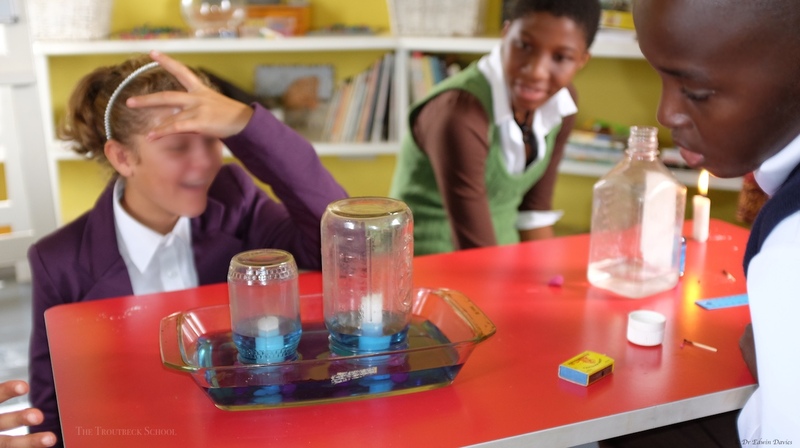 So it turns out that the hot carbon dioxide created as the candle burns is initially lighter than the air in the jar and so rises to the top and then accumulates in the jar from the top down. Once the carbon dioxide reaches down to the level of the flame it extinguishes it (just like a carbon dioxide fire extinguisher). Note that carbon dioxide gas is heavier than air once at the same temperature – though under normal conditions they would diffuse together (mix) to fill a volume evenly. That explains why the candle goes out, but why does the water level go up with all this new carbon dioxide gas building up inside? This is equally interesting. Initially the burning candle warms the air in the jar which expands and some air is forced out at the bottom. 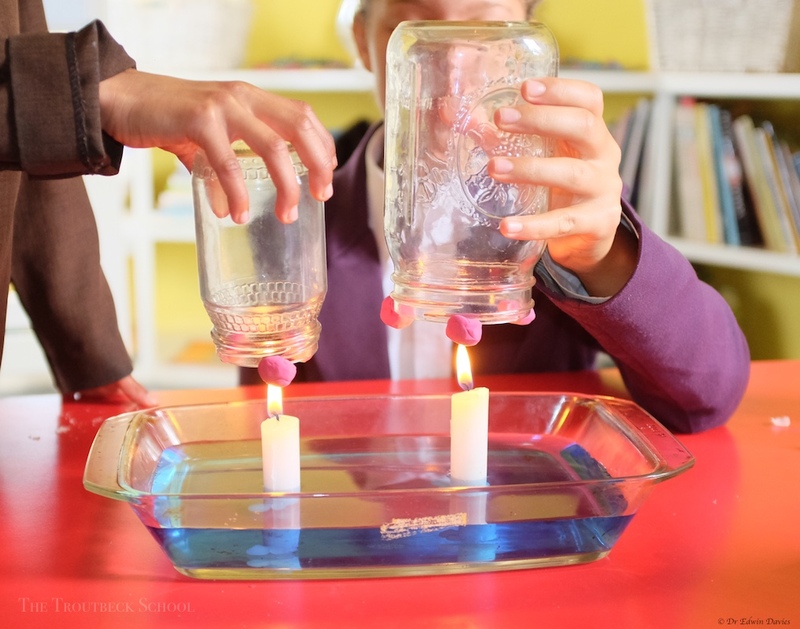 Then, as the candle flame is extinguished the air quickly cools against the cold glass of the jar and contracts taking up less volume thus drawing up water into the jar. This explains why when you try it at home you will see scarcely any change in the water level whilst the candle is burning but a big inrush of water at the end as the candle goes out. We did learn an important lesson as well – don’t believe everything you read.